Born: August 9, 1800 in Sandwich Ma. Died: November 6, 1886 in Bourne Ma. at 86 yrs, 3 mos. 1. Elizabeth Brown Howard Nye; (December 2, 1824 – January 17, 1914); Married Ephraim B. Nye, Lt., Civil War (1826 – 1865) (Ebenezer Nye, Jr., Capt. & Syrena Dimmick) in Sandwich Ma. on May 30, 1848; Ephraim is buried in Cataumet Cemetery. 2. Charles Foster Howard; (March 5, 1827 – January 21, 1892); Married Ann Louisa Fish (1837 – 1920) (Isaiah Fish, Jr. & Caroline Fisher) in Sandwich Ma. on November 29, 1857; Ann married (2) Reuben Wats Lawrence (1835 – 1932) (Edward Doty Lawrence & Elizabeth B. Howard) in Bourne Ma. on December 31, 1903; Reuben married (1) Ophelia D. Chadwick (1842 – 1873) (Ebenezer Dimmick Chadwick & Phebe Hatch) in Sandwich Ma. on January 4, 1863; Charles, Reuben & Ophelia are buried in Cataumet Cemetery. 3. Lucy Handy Howard Swift; (February 22, 1829 – October 16, 1917); Married Aaron Cornish Swift (1829 – 1917) (Nathan Barlow Swift & Pamelia Cowing) in Sandwich Ma. on July 6, 1851; Lucy & Aaron are buried in Cataumet Cemetery. 4. 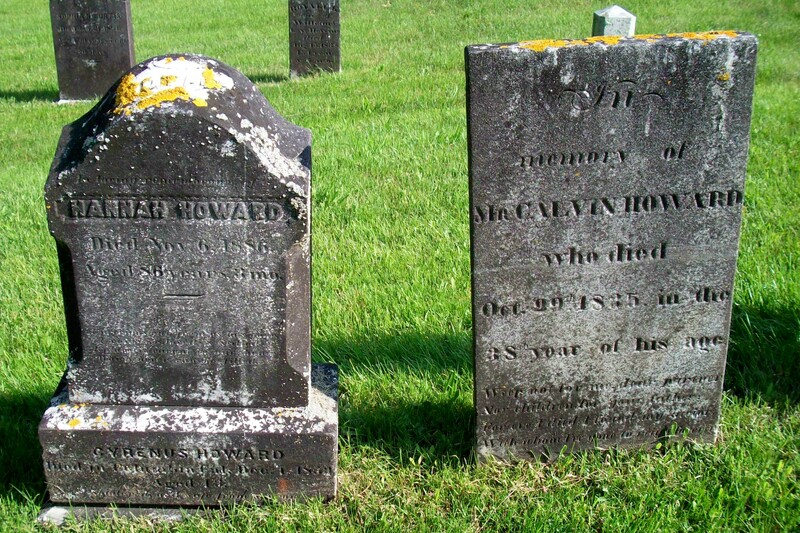 Ezra Coleman Howard; (September 1, 1831 – April 8, 1885); Married (1) Caroline S. Dimmick (1834 – 1874) (Frederick Dimmock, Capt. & Maryann N. Lawrence) in int. November 19, 1856 & married (2) Rhoda Ann (Dimmick) Burgess (1830 – 1907) (Frederick Dimmock, Capt. & Maryann N. Lawrence) in Sandwich Ma. on June 25, 1876; Rhoda married (1) Henry Burgess (1829 – ?) (William Burgess & Mary (–)) in Sandwich Ma. on March 3, 1853; Ezra, Caroline & Rhoda are burried together in Cataumet Cemetery. 5. Calvin Howard, Jr.; (July 10, 1834 – April 29, 1855); Unmarried; Calvin, Jr. is buried in Cataumet Cemetery. Married (2): March 3, 1840 in Sandwich Ma. by William Tozer. 1. Roland Swift Howard; (January 27, 1841 – September 15, 1870); Married Emeline/Emma Annette Gurney (1841 – ?) (Heman Gurney & Lois (Swift) Skiffe) in Sandwich Ma. on December 16, 1861; Emeline/Emma married (2) George A. Earle (1841 – 1908) (Moses Earle & Priscilla Weeks) in Sandwich Ma. on March 31, 1875; George married (1) Almira Bennett (1843 – ?) (George Bennett & Betsey Mulford) in Sandwich Ma. on December 25, 1864; Roland is buried in Cataumet Cemetery. 2. Susan Fear Howard Wing; (August 14, 1843 – November 22, 1902); Married William Henry Wing (1846 – 1908) (Nathaniel Wing & Hannah Snow (Burgess)) in Cataumet Ma. on November 28, 1867; Susan & William are buried in Cataumet Cemetery. 3. 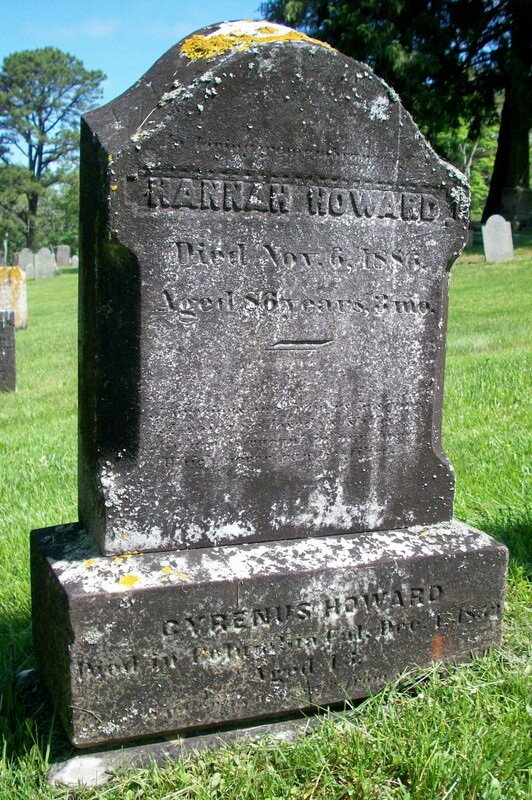 Caroline Howard; (June 23, 1845 – July 1, 1846); She died at 1 mo, 8 d. & is buried in Cataumet Cemetery.